"Best not to get used to that," I tell myself. It's not a good thing to start missing the company of your own imagination.Have you ever watched a movie with a great deal of suspenseful buildup, only to get to the end and realize that you were sitting around waiting for nothing? *edit* I do need to clarify that there was a huge creep factor at the end. I guess I just wanted more knowledge or closure, or something. Even if this does end up being turned into a series, I really don't feel enough to want to continue on.Apathy : I have it. I'm having a slight amount of guilt over my non-desire to want to review this book. There's got to be something I can say to help people decide whether or not to read this. Obviously, me just saying I do/don't like something isn't always a solid indicator, since I've been known to dislike books which other people love. *cough* [b:Insanity|13557662|Insanity (Asylum, #1)|Lauren Hammond|http://d.gr-assets.com/books/1358028286s/13557662.jpg|19129835] *cough* Oh hey, that was kind of a similar subject to this one. Well, maybe not exactly. Insanity was more sappy romantic. This book had its pine-y moments as well, but not with the same amount of overzealous thrust. Yes, I used thrust. I'm not sure why that was my word of choice. 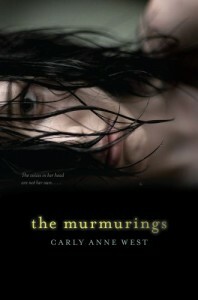 So in this case, who might actually enjoy The Murmurings?I had similar feelings while reading [b:Bad Girls Don't Die|3678651|Bad Girls Don't Die (Bad Girls Don't Die, #1)|Katie Alender|http://d.gr-assets.com/books/1344514129s/3678651.jpg|3722007]. Sooooo...if you were a fan of that book, you might enjoy this one. Review over. I'm tired. And lazy. And completely ready to move on to something else.This book was provided from the publisher through Edelweiss in exchange for an honest review. As this was an advanced release copy, the quote mentioned may not be present in the final copy.